TRAINING HARD ... David Vaughan. DAVID Vaughan is confident Sunderland’s 4-4-1-1 formation can reap rewards as he prepares for his Black Cats bow. Vaughan is in contention to make his first Sunderland start in tonight’s Carling Cup second round clash at Brighton after being a late replacement in the opening day draw at Liverpool and an unused substitute in Saturday’s derby defeat. The Welsh international habitually found himself as a central midfielder in a 4-4-2 formation at former club Blackpool, but Sunderland look set to persist with the ploy of using Stephane Sessegnon as a withdrawn striker despite taking a solitary point from the opening two Premier League outings. Vaughan believes the system suits the resources at Steve Bruce’s disposal, with Sessegnon providing Sunderland’s main attacking threat against Liverpool and Newcastle. It is a formation that Bruce believes will offer more defensive stability – especially away from home – as well as bringing a different dimension to the Black Cats going forward. The 28-year-old told the Gazette: “It does help playing that system. When you’ve not got the ball, there’s an extra man in there to help you out. “And you can play a shorter pass when you’ve got the ball because there’s a deeper striker to pick out. Vaughan and fellow summer signings Keiren Westwood and Craig Gardner are all set to feature in Sunderland’s first ever trip to the Amex Stadium as boss Bruce looks for a tonic to the derby blues. 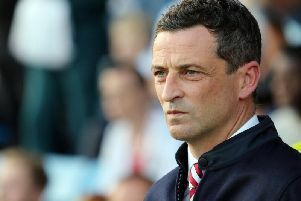 Bruce has resisted the temptation to throw the bulk of his fresh faces into the mix so far, and Vaughan admits the players already plying their trade on Wearside make it difficult for the new boys to feature. He added: “I knew quite a lot of the lads after playing against them last season. I knew there were some good players here. “But the overall standard of training has been really high, which has surprised me a bit.